Krista told us that this garden, which is right across the street from her apartment, is the most beautiful in Geneva. 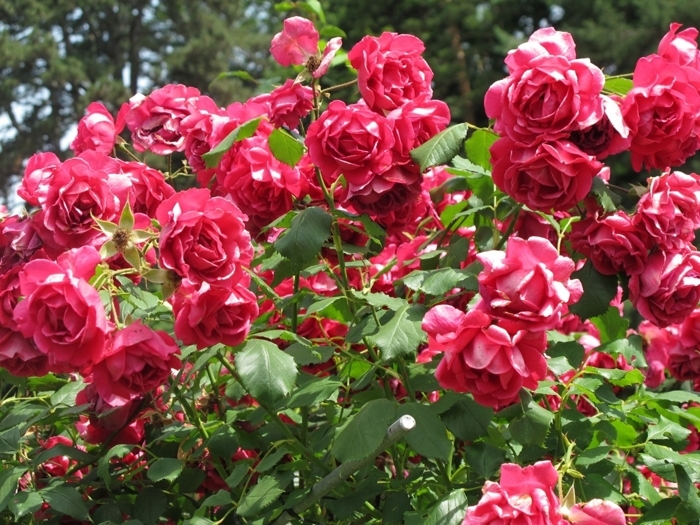 It is an English style landscape park and has a spectacular assortment of old trees, an 18th century villa, and roses of all colors. The park is a favorite place for locals to relax, have picnics, and listen to frequent music concerts. There are numerous fountains and pools in the park. Can't you just imagine relaxing here on a summer day? We would have loved to have done so, but we were virtually comatose as we were visiting after being up for about 24 hours. We were trying to keep ourselves awake with our stroll to try to get our bodies used to the time change. Translation: Jet of Water. First installed in 1886 a bit further downstream from its present location, the Jet D'Eau was used as a safety valve for a hydraulic power station. It became recognized for its aesthetic value, and in 1951 was installed in its present location and now reaches a height of 459 feet. Since, 2003 it has operated all year round -- except in the case of high winds and/or frost -- and is one of the most well-known symbols of Geneva. We marveled at the walkway which allows visitors to travel directly to the Jet D'Eau. In the USA, there would be rails and warning signs, if the path would be open at all, for fear of litigation should an accident happen. But here in Geneva, not so. It's not that far of a drop into the water anyway. :) Krista and Judy didn't fall in, although the heat of the summer day made a swim awfully tempting! Krista and Ken posing in front of a fountain in the Old Town of Geneva. There were fountains all over the place and most of them have potable water, which was great on a day that had to be in the mid-90's. We filled up our water bottles many times. 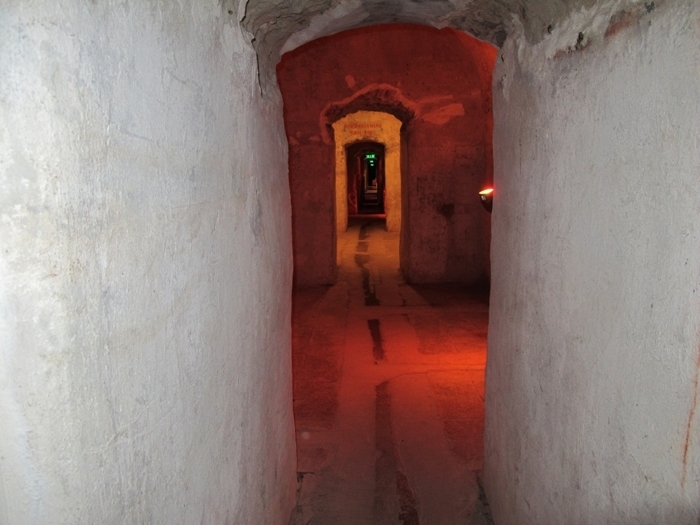 The Old Town was once fully surrounded by a wall, much of which is still in existence today. It is beautiful and has architecture that dates back to before the 12th century. 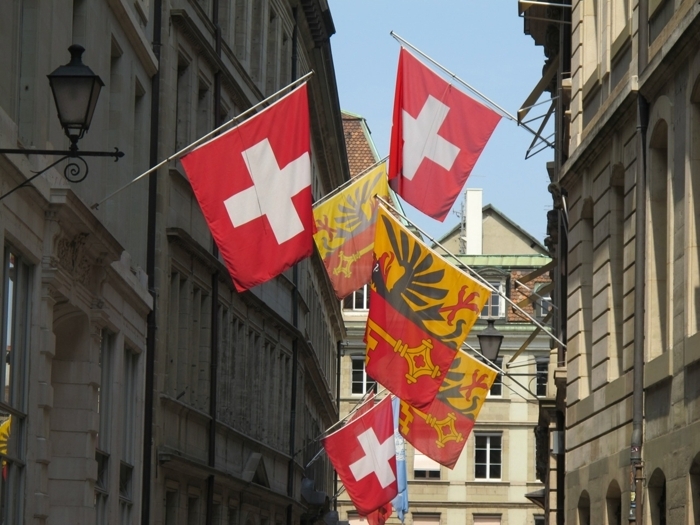 The Swiss flag is a white cross on a red background and has its origin in late middle ages with the symbol of the Holy Roman Empire. The symbol of the International Red Cross is the reverse of this flag. The flag of Geneva is yellow and red with symbols including an eagle, symbolizing justice and protection, and a key symbolizing responsibility. Judy always wants to know about the symbolism of flags. 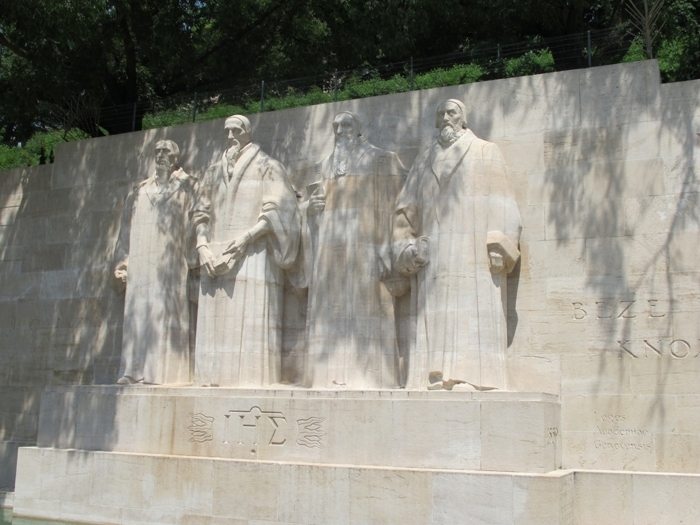 The Reformation Wall was built to commemorate the 400th anniversary of Calvin's birth and the 350th anniversary of the University of Geneva, on the grounds of which the Wall is located. 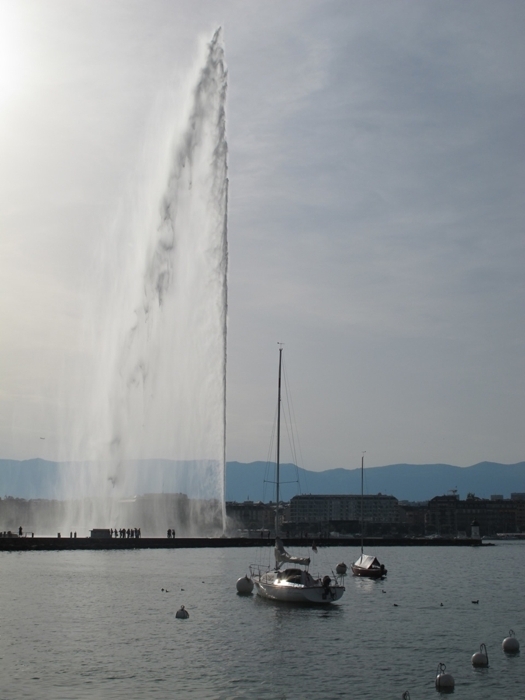 During the Reformation, Geneva was the center of Calvinism, and its history and heritage since the sixteenth century has been closely linked to that of Protestantism. Due to the close connections to that theology, the individuals most prominently depicted on the Wall were Calvinists; nonetheless, key figures in other theologies are also included. The motto of both the Reformation and Geneva is engraved on the wall: "Post Tenebras Lux", Latin for "after darkness, light". 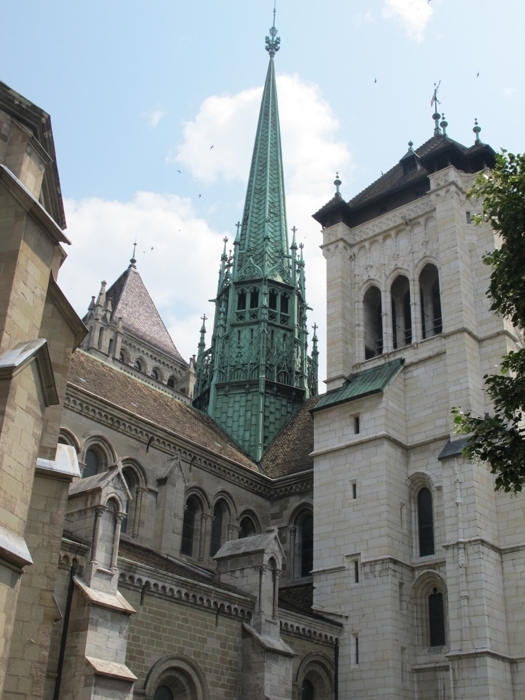 Cathedrale St-Pierre is an imposing Romanesque-Gothic church with a Neoclassical facade. It is the church in which John Calvin gave his inspiring sermons during the mid-16th century and John Knox preached and supervised the production of the Geneva Bible. The Calvinists had little tolerance for religious images and any kind of excess and stripped the cathedral to its most basic elements. A panoramic view of Geneva is available from the north tower of the cathedral, which is reached by climbing 157 narrow steps. Ken captured a wonderful photo of Krista in a tower window, with the city roof tops and the Jet D'Eau in the background. Krista surprised us with a drive around Lake Geneva, which included going to France. We hadn't been expecting a trip to France! First stop was Yvoire Medieval Village, a delightful preserved village surrounding Yvoire Castle, which dates back to the 14th century. The Castle was set on fire in the mid-16th century by the Bernese, sitting roofless for the next few hundred years. The Bouvier family has owned the Chateau since the 17th century and has not opened it to the public but they did transform the former kitchen garden into the Garden of Five Senses back in the 1980s, based on the enclosed gardens that existed in medieval times. 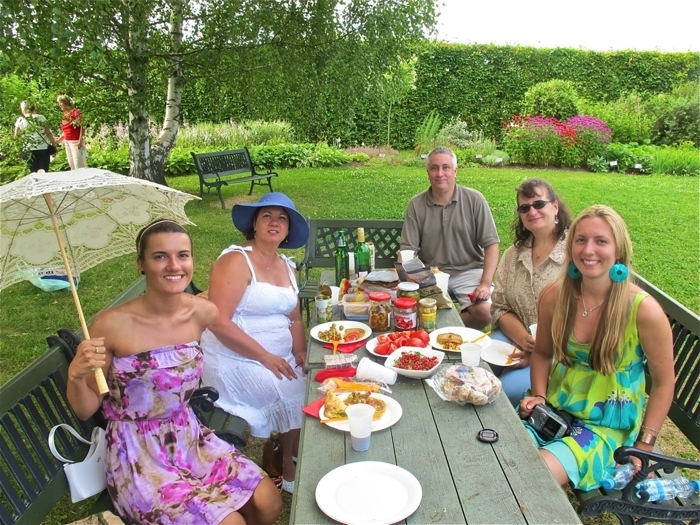 After touring the gardens, we had a wonderful lunch and coffee in a little cafe before continuing around the lake. Krista and her beau, Vinicius from Brazil. They are so sweet together and obviously make each other extremely happy. Vinicius was our driver today. What a lovely day, sitting in the back of the convertible with the wind blowing and the sun shining. Fortunately, we remembered to wear sun screen. 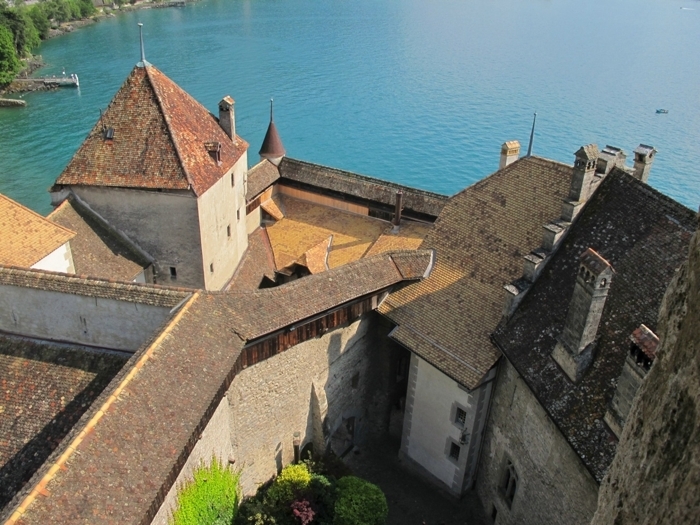 Our next stop was Chillon Castle (Chateau de Chillon), the most visited and photographed castle in Switzerland. The Castle consists of 100 independent buildings that were gradually connected to become the building as it stands now. While the oldest parts of the castle have not been definitively dated, the first written record of the castle is in the early 11th century. 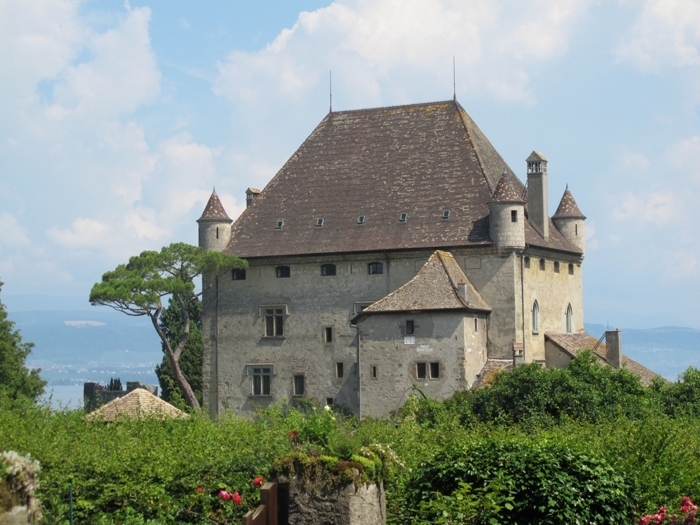 It was home to the Counts of Savoy in the 12th century and was made popular by Lord Byron, who wrote the poem The Prisoner Of Chillon (1816) about Francois de Bonivard, a Genevois monk and politician who was imprisoned there from 1530 to 1536. Byron also carved his name on a pillar of the dungeon. This photo is from the top of the castle keep, which we climbed on a particularly hot day. 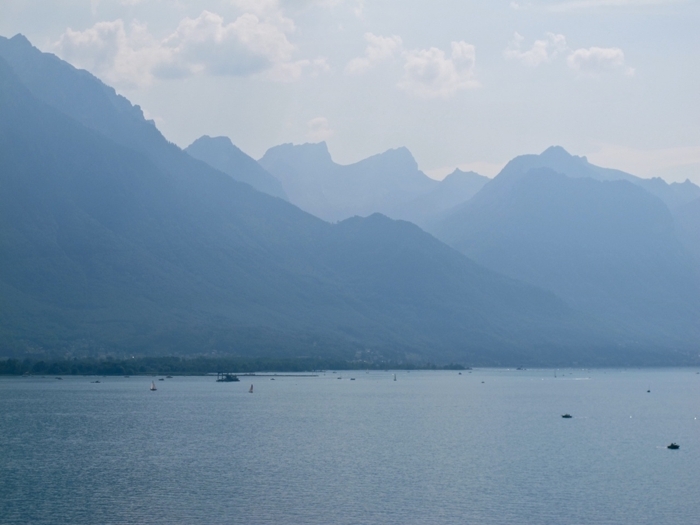 Across Lake Geneva, the beginnings of the Swiss Alps are visible. These "pre-Alps" or "baby-Alps" are nothing in comparison to the height of the full-fledged Alps. But to put it in perspective for our friends back home, these baby mountains must be 4-5 times taller than the mountains of Garrett County. Wow! 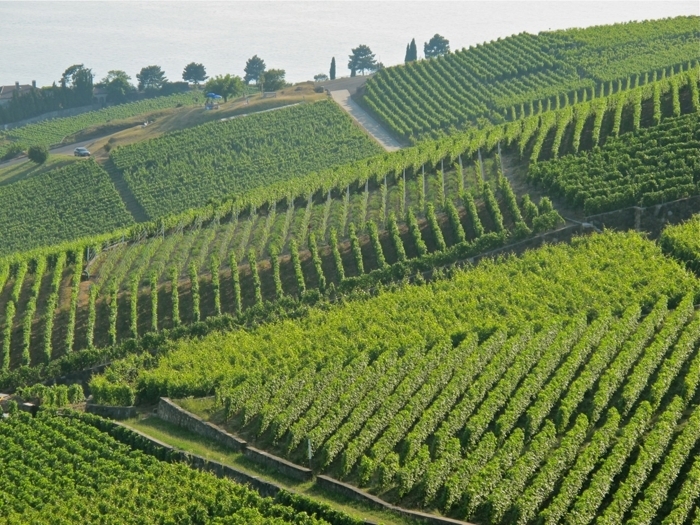 In 2007, the Lavaux Vineyards, Switzerland's largest wine-producing area, was added to the UNESCO World Heritage List. Evidence suggests that vines were cultivated in the area in Roman times, while the present vine terraces have been traced to the 11th century. At that time, Benedictine and Cistercian Monasteries controlled the land. Currently, the Lavaux vineyards stretch about 30 kilometers along the northern shores of Lake Geneva in the French-speaking part of Switzerland. Many of them have been run by the same families for generations. According to UNESCO, the vines, buildings and surrounding villages reflect how production of wine has changed over the past 10 centuries. For us, it was Sunday and the vineyards were closed, but it didn't stop us from driving around the UNESCO site and enjoying the beauty of the views. Today, we enjoyed a slow-moving morning with Krista, complete with good conversation, the best caffe au lait Judy has ever had, and chocolate croissants for Ken and Krista. 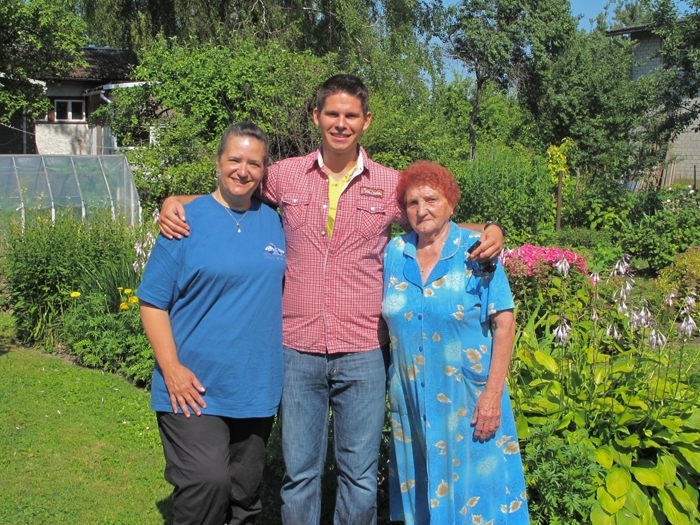 We then flew to Riga, Latvia, where we received a warm welcome, lots of hugs and kisses, and a traditional flower bouquet from Lasma, Madara, Imants, and Ingrida. This photo was taken in the airport shortly after we arrived. 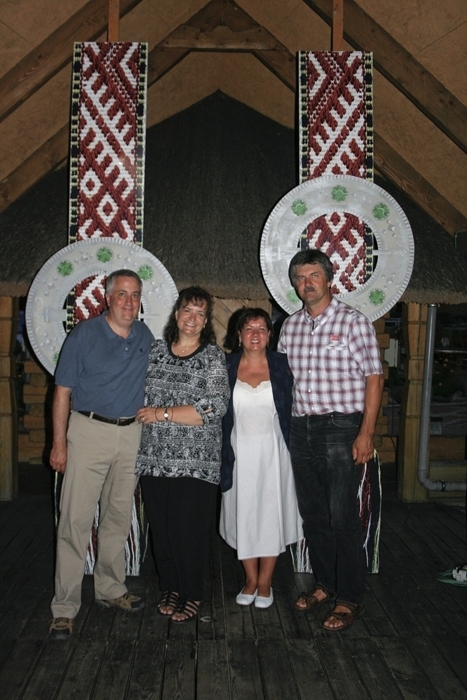 We were taken to dinner at the Lido Center, which is a must-see attraction in Latvia. 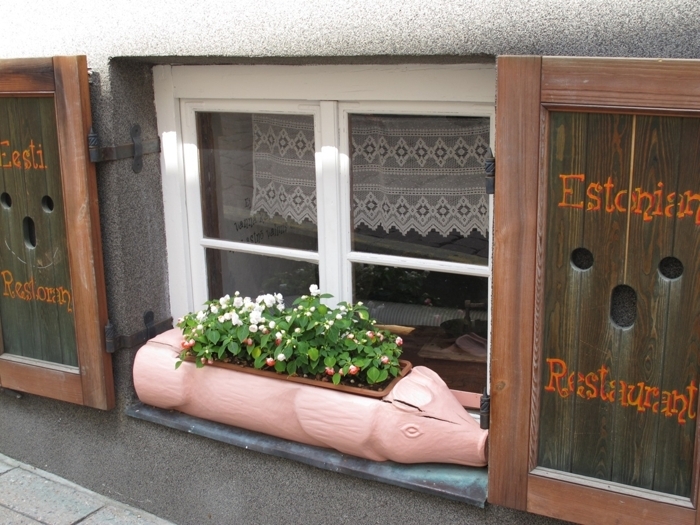 It has a traditional Latvian atmosphere, a smorgasbord of traditional Latvian food, and beer brewed right on site. 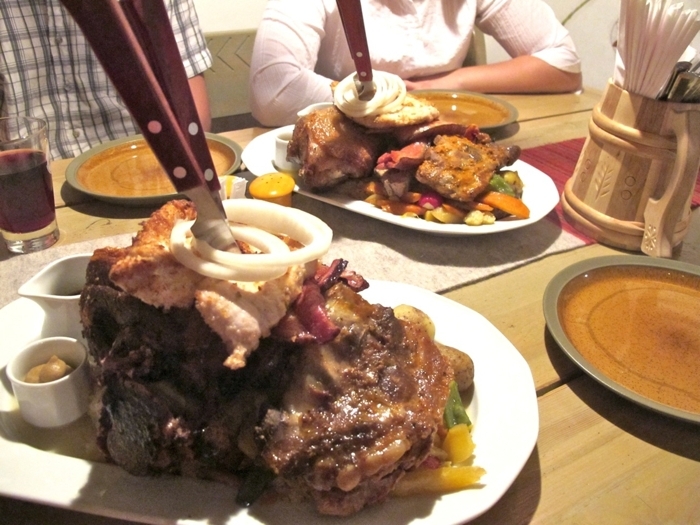 We tried griki, shashlik, mushrooms in cream sauce, potato pankucas, and, of course, Latvian beer. 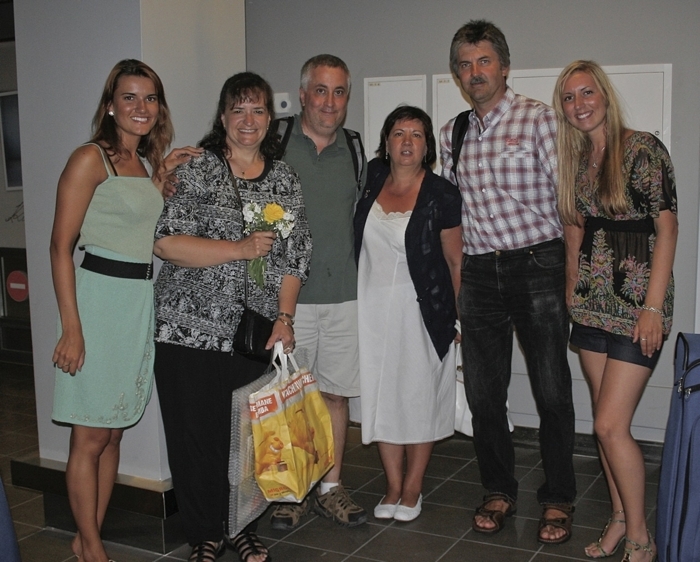 What a delicious meal and a loving welcome to Latvia. 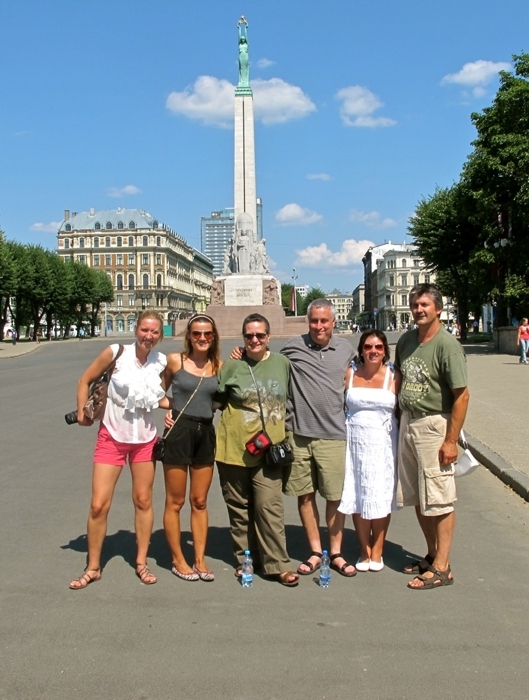 Today, we walked around Riga, starting in Old Riga. 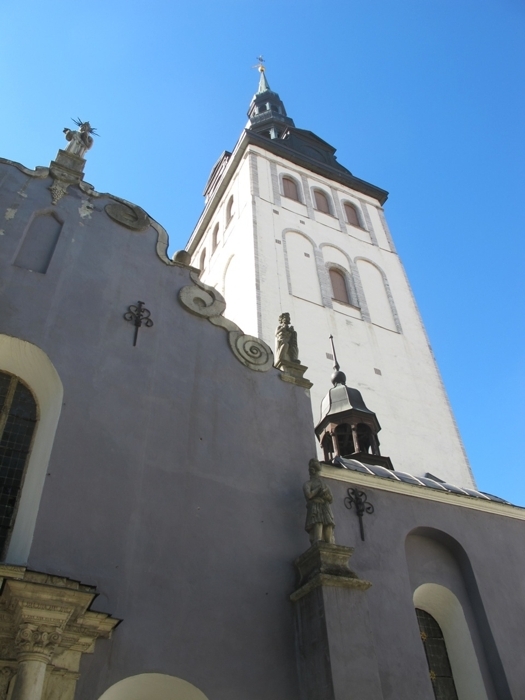 Our first stop was St. Peter's Church, one of the most impressive examples of medieval architecture in Riga. 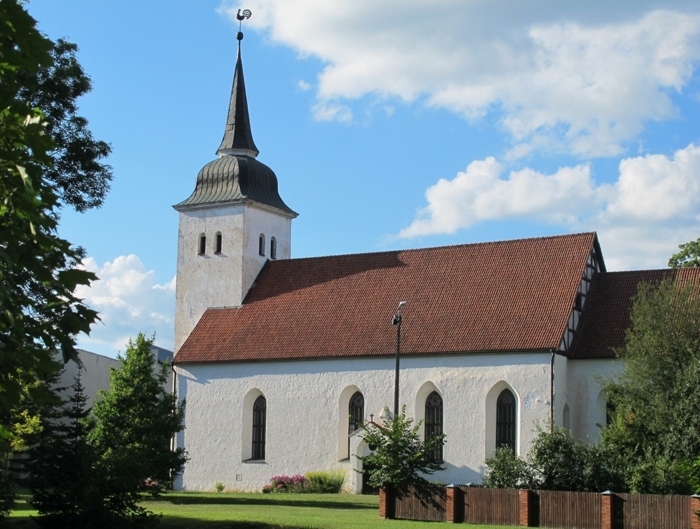 The church is first mentioned in records in 1209, although it was rebuilt and renovated many times in the intervening years, especially due to several fires and a shell hitting the tower during World War II. 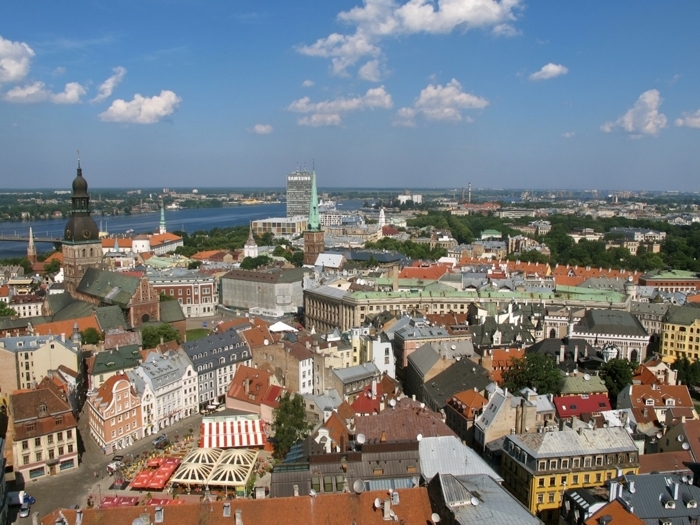 This photo is taken from the top of the restored tower, which offers a magnificent 360 degree view of Riga. From the top, one can see the Daugava River leading to the Baltic Sea and many examples of Riga's magnificent Art Nouveau architecture. 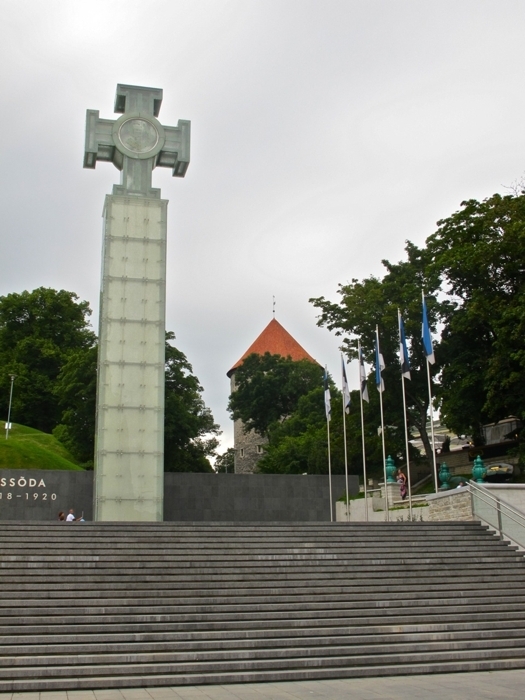 The Monument of Freedom is a sacred place to the people of Latvia and a source of national pride. 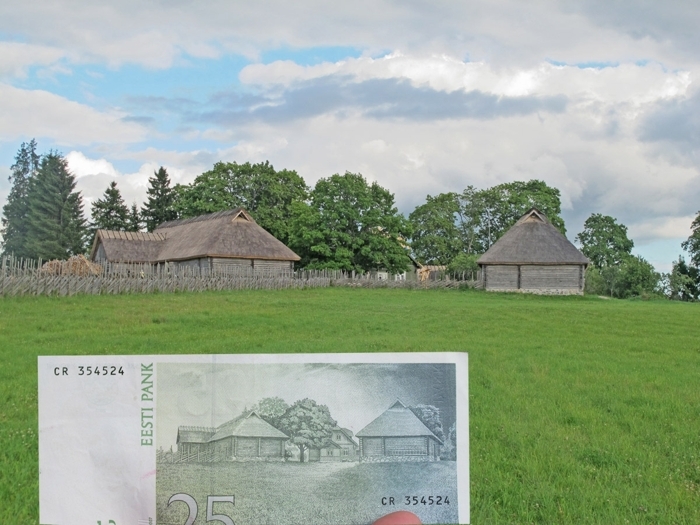 Completed in 1935, it was built with money donated by the people of Latvia. It consists of 13 sculpted groups and represents the wisdom gained from the past, the hope for continued independence, and the optimism for the future. Atop the monument stands Mother Latvia, holding three stars that represent the ethnographical regions of Latvia that existed at the time (there are four regions today). Amazingly, during the Soviet occupation, the Monument of Freedom was not destroyed, as were many other symbols of Latvian nationalism. It survived the occupation and is an even more cherished symbol of freedom. Kronvalda Park is a beautiful natural respite in the middle of Riga. 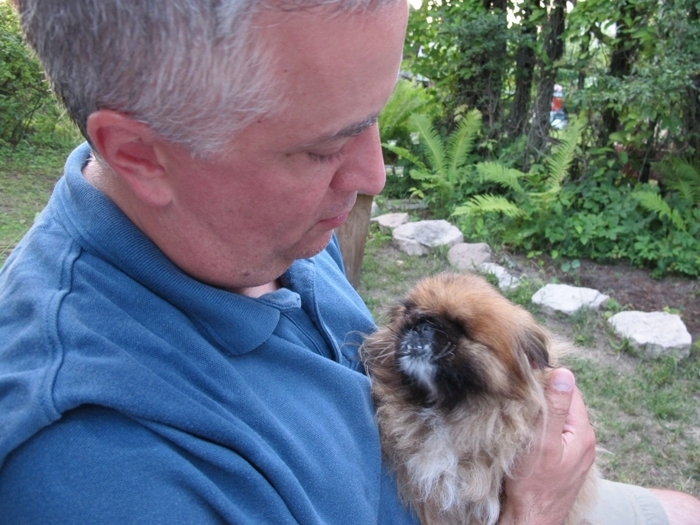 We walked the park -- strolled really -- and saw all sorts of wonderful human, natural, architectural, and animal sites. 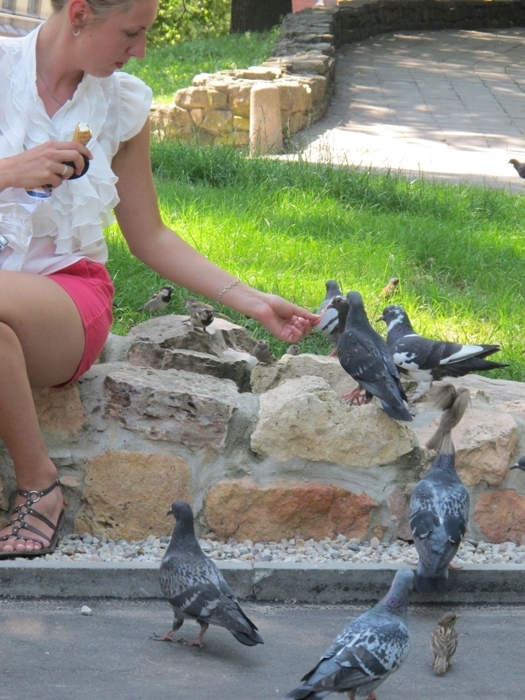 While sitting and enjoying an ice cream, Lasma started feeding pieces of the cone to several birds. She soon had a literal flock of them eating out of her hand. It was a delight watching her tenderly feed the birds. 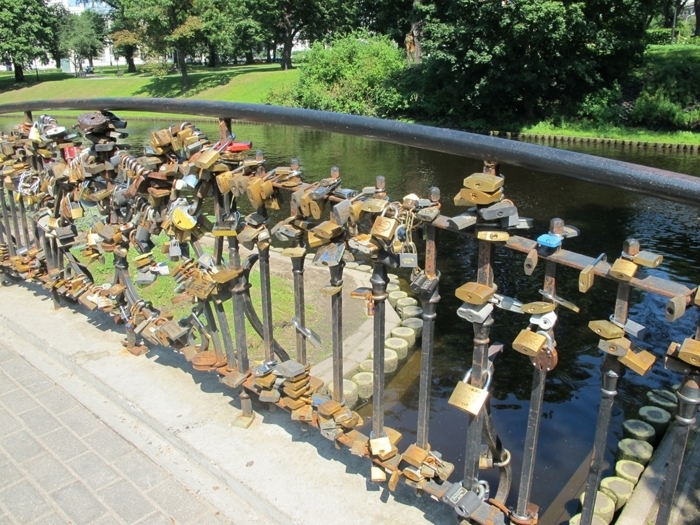 Several of the bridges in Riga are adorned with locks, this one in Kronvalda Park. As it was explained to us, folklore has it that newlyweds who afix a lock to a bridge and throw the key into the river cannot be divorced unless the key is retrieved from the bottom of the river and the lock opened and removed. There were so many locks on the bridges we crossed...it was intriguing to read the names and dates on each of them and imagine the ritual of placing them there. Riga is recognized by UNESCO as having the finest collection of Art Nouveau buildings in Europe and was added to their World Heritage List in 1997. 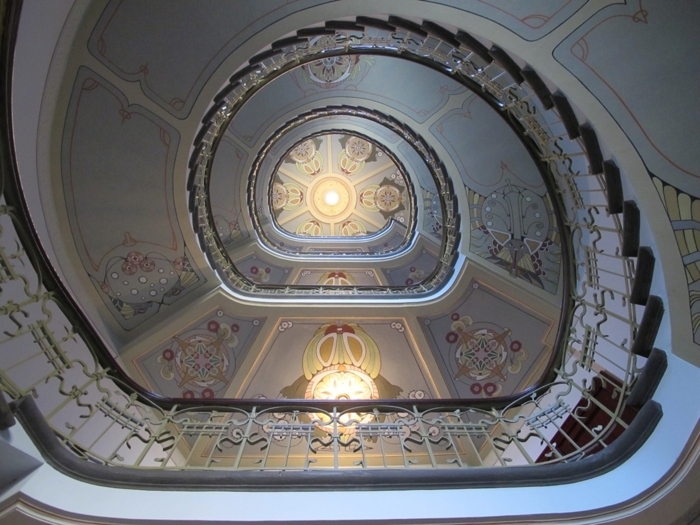 Today, we saw numerous examples of Art Nouveau buildings and toured the Riga Art Nouveau Museum, an art nouveau-styled apartment restored to how it looked in 1903. This is the dramatic spiral staircase in the museum's entrance. The Nativity of Christ Cathedral in Riga is a Russian Orthodox church built in a Neo-Byzantine style between 1876 and 1883, during the period when the country was part of the Russian Empire. It is known for its magnificent icons. 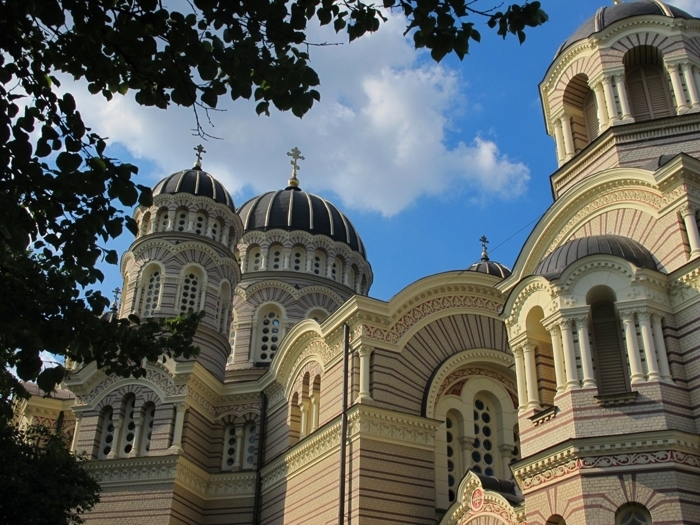 During the First World War German troops occupied Riga and turned its largest Russian Orthodox cathedral into a Lutheran church. 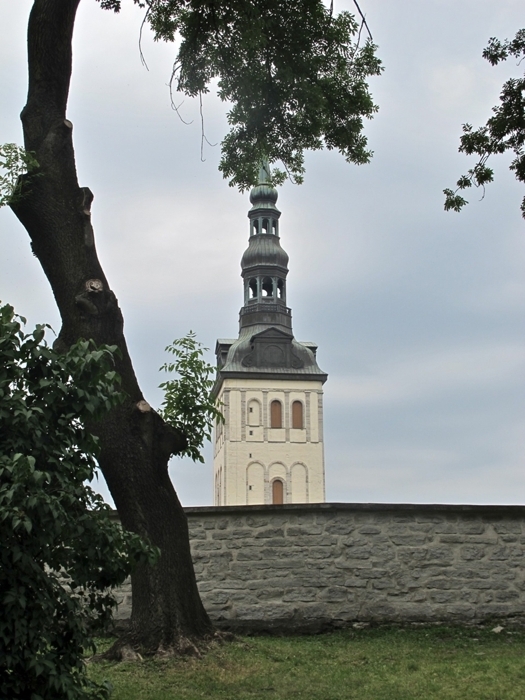 In independent Latvia the Nativity of Christ Cathedral once again became an Orthodox cathedral in 1921. In the early 1960s Soviet authorities closed down the cathedral and converted its building into a planetarium. 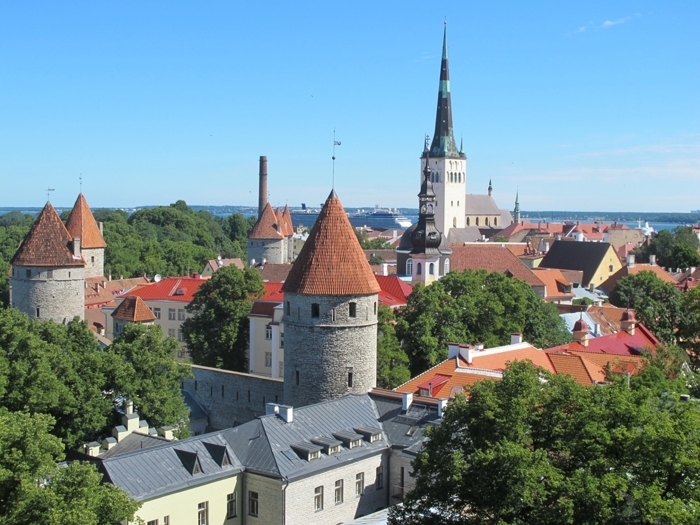 The cathedral has been restored since Latvia regained independence from the Soviet Union in 1991. Today we visited Rundāle Palace, one of the major tourist destinations in Latvia. 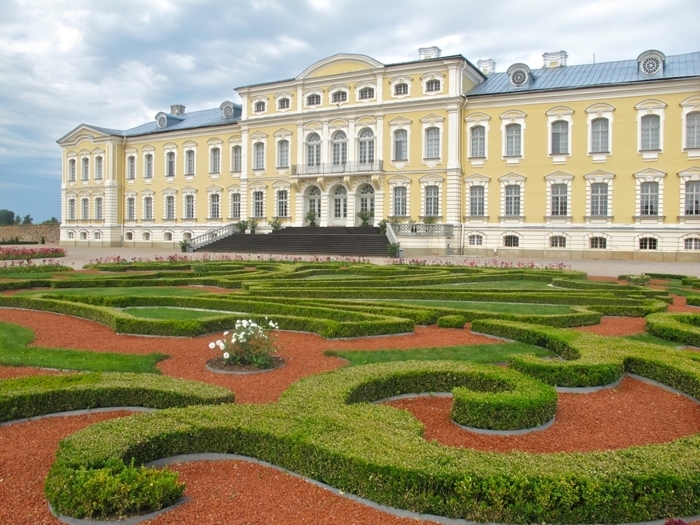 It is one of the two major baroque palaces built in the 18th century for the Dukes of Courland in what is now Latvia. It was constructed in the 1730s to a design by Bartolomeo Rastrelli as a summer residence of Ernst Johann von Biron, the Duke of Courland. After Courland was absorbed by the Russian Empire in 1795, Catherine the Great presented the palace to her lover, Prince Zubov, who spent his declining years there. His young widow remarried Count Shuvalov, thus bringing the palace to the Shuvalov family, with whom it remained until the German occupation in World War I when the German army established a hospital and a commandant's office there. 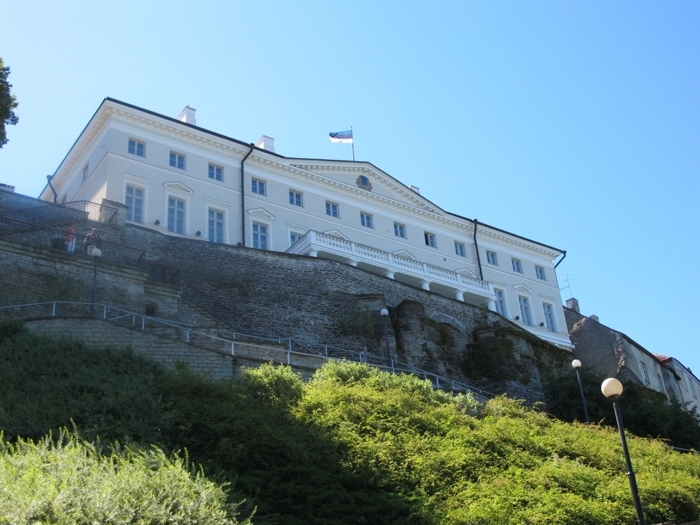 The palace suffered serious damage in 1919 during the Latvian War of Independence. In 1920, part of the premises were occupied by the local school. In 1933, Rundāle Palace was taken over by the State History Museum of Latvia. It was dealt a serious blow after the World War II, when a grain storehouse was set up in the premises and later the former duke's dining room was transformed into the school's gymnasium. 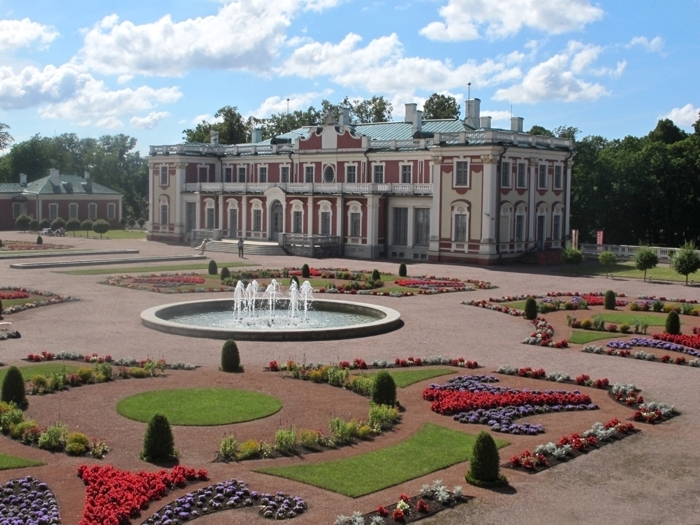 Only in 1972 was a permanent Rundāle Palace Museum established. Today, the palace is visited by thousands of guests each year and is also used for the accommodation of notable guests, such as the leaders of foreign nations. The palace and the surrounding gardens are now a museum and both continue to be renovated. Much of the interior of Rundāle Palace has been restored to its grandeur. 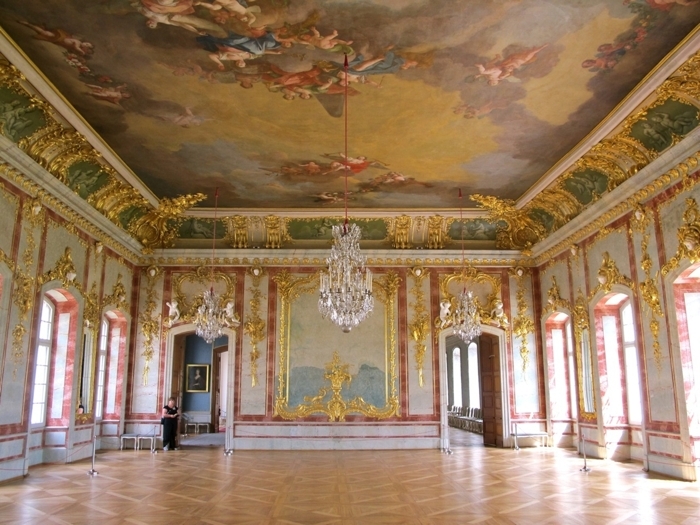 The Gold Hall, pictured here, is the most luxurious room of the palace. One can just imagine the balls that were held here with attendees in all their finery mirroring the decor of this grand Baroque room. 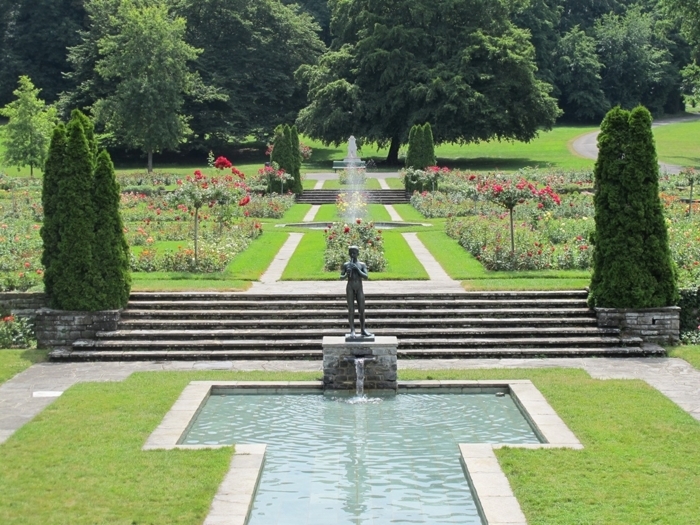 The gardens of Rundāle Palace rivaled the magnificence of the interior. We strolled well groomed paths through geometric gardens and rose beds with varieties too numerous to count. Imants and Ingrida had arranged for us to have a picnic in a private garden, with Imants grilling Latvian sausages for us while Ingrida, Lasma and Madara served a true feast. It was a lovely, relaxing day! Ingrida had brought along a parasol, to help protect us from the sun a bit and to lend an air of authenticity to the romance of the afternoon. We got a little carried away with the parasol pictures but had a lot of fun. This is an adorable one of Maddie and Lazzie, who are both posing professionally for the camera. On the way home from Rundale Palace, we stopped at Bauskas Castle. 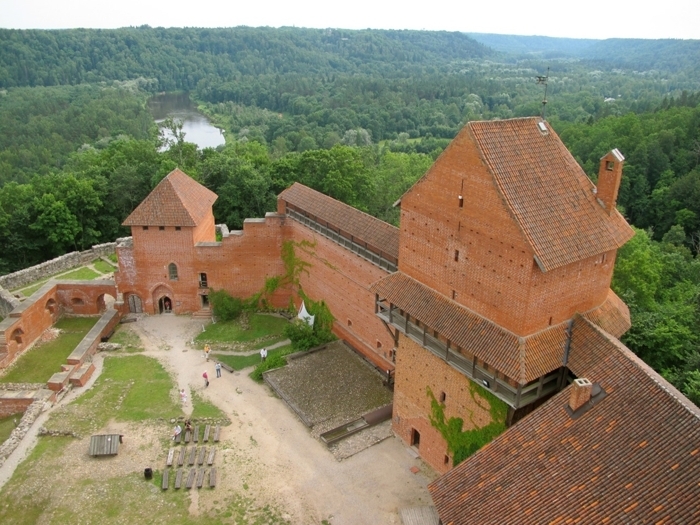 Bauskas Castle was built in 1443 and was one of the last castles of the Livonian Order. After the Great Northern War, the castle became deserted and local inhabitants secretly began to take bricks from the castle as building material. 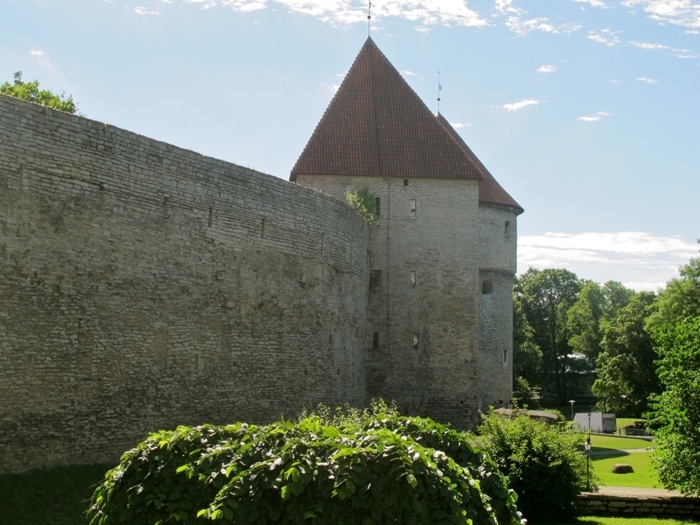 The walls and one of the towers remained intact over the years, but the remaining four towers have been rebuilt. We walked around the castle while listening to Ingrida's stories about guards and knights from the castle's history, and also listening to the rumblings of an approaching storm. 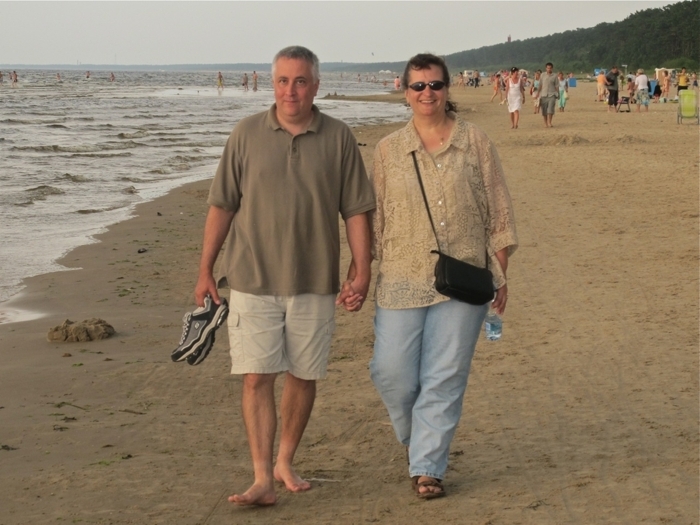 Before arriving back in Old Riga and our hotel, we stopped at Jurmala to visit the beach. 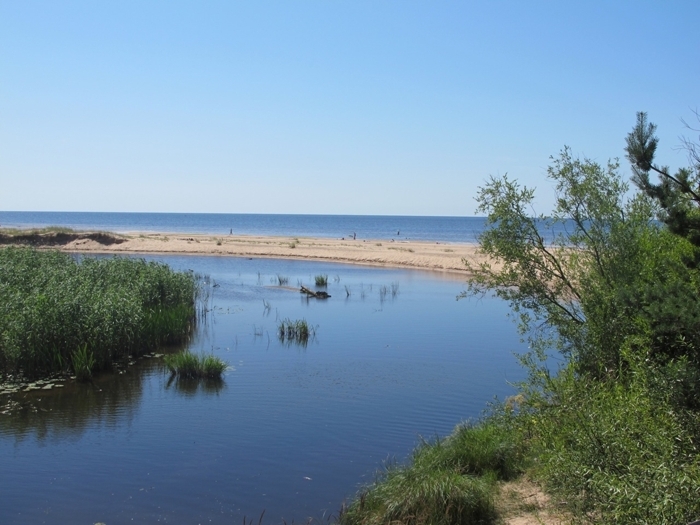 Located just outside of Riga on the Baltic Sea, the beach is popular with summer visitors. The water was warm, the sand fine, and the stroll relaxing as we enjoyed the waning sun, which doesn't set until about 10:30 or 11:00 PM in July. 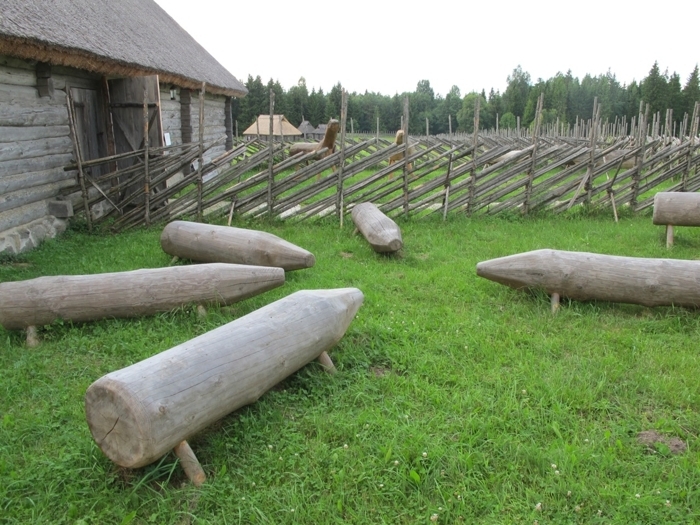 The Open-Air Ethnographic Museum of Latvia is an amazing place with more than 140,000 items, including more than 120 buildings, from many different historic times in Latvia. 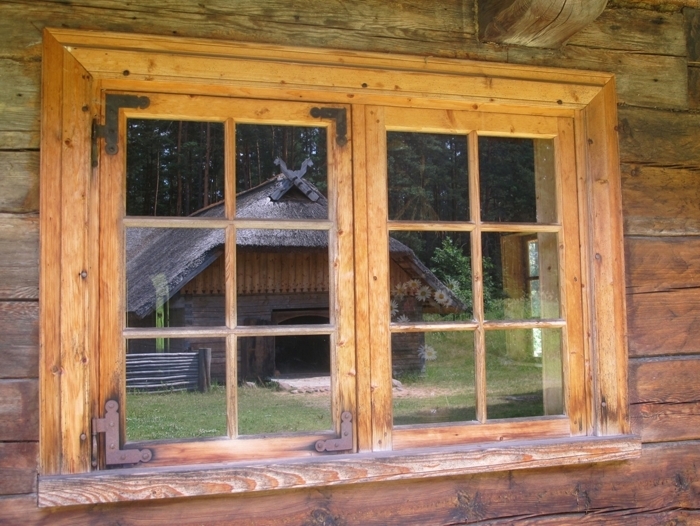 Most of the buildings are furnished with authentic items, placed as they were originally used, and staffed with people in traditional clothes engaged in traditional activities. The museum was founded in 1924 and the first buildings were then moved to the museum from their original locations. We walked much of the museum, which covers almost 220 acres, and had a wonderful day. 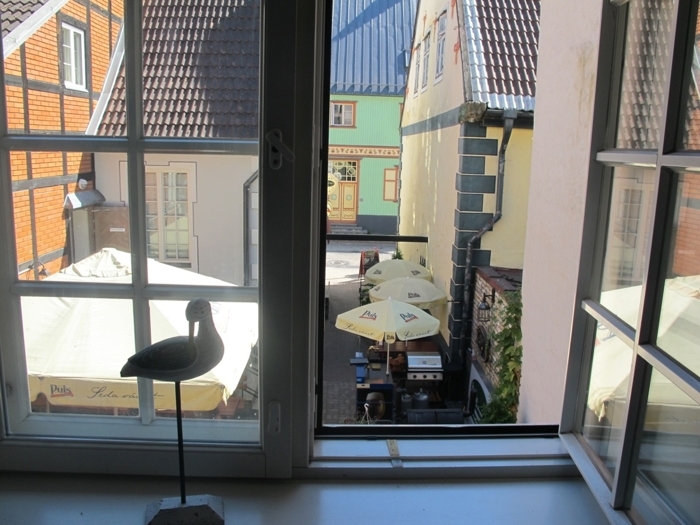 The reflection in this window is that of an ancient building with a traditional Latvian symbol on the roof. It was believed that this symbol would bring protection and good luck to the household. We couldn't tell whether the heads were of horses or dragons. The museum has at least two windmills, the one pictured here being the biggest. 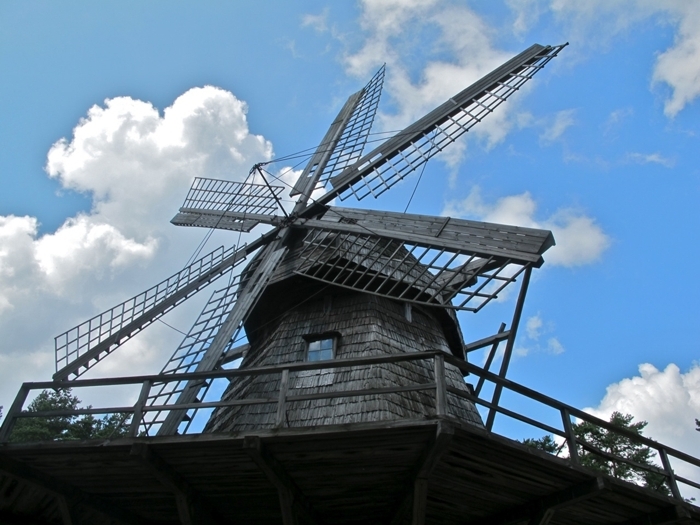 Latvians seem to really like windmills, and they are pictured on quite a number of their popular products. There is also a windmill at Lido, the recreation center in Riga where we ate the first night; this wind-mill, however, experienced a problem when all but two of its blades fell unexpectedly two nights before we ate there. Two nights after we ate at Lido, the other two blades were also removed, and the windmill was bladeless. 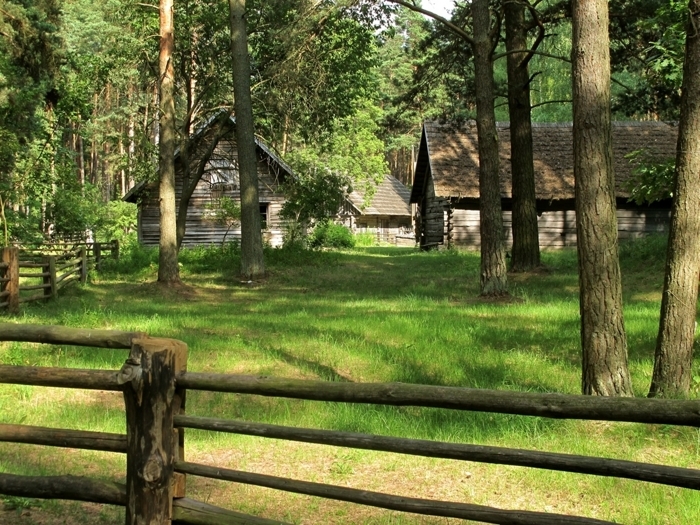 Few windmills have survived in the Latvian countryside. 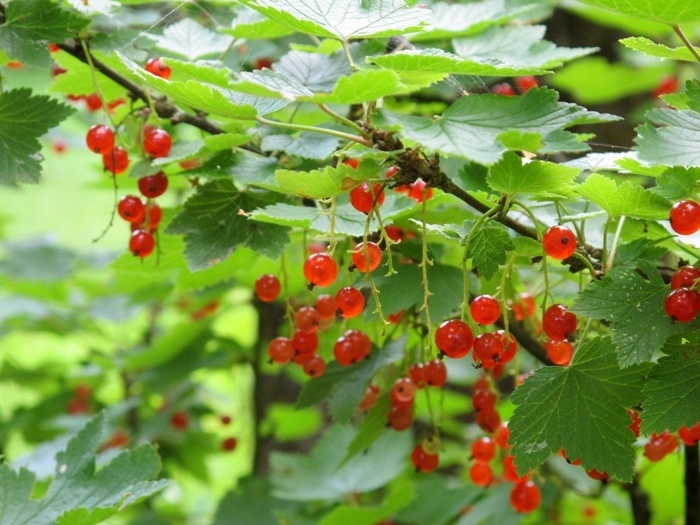 Currants are a favorite of Latvians and Estonians. In the states, we have enjoyed currant jelly and currant tea, but we had never seen them growing. They come in red, white, and black, and we got to pick them right off the bush and try them. The white ones, fully ripe, were definitely the sweetest. Vendors on the streets of Riga selling fruit often sell fresh currants. We spent the evening on our own in Old Riga, including dinner at the Ziva Govs ("Blue Cow"), a steak and fish restaurant located on one of Riga’s most popular Old Town squares, Līvu laukums. 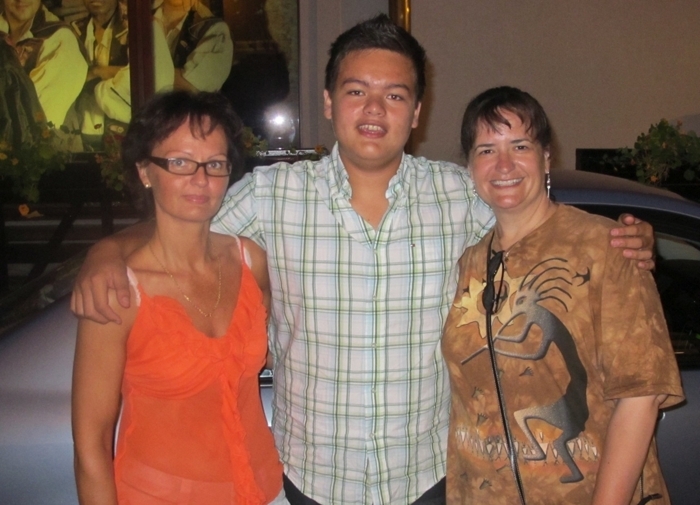 During dinner, we were treated to a serenade by a wonderful street performer baritone singing opera. After dinner, we walked some of the cobble stone streets to see Riga by night. This photo is of the House of the Blackheads. 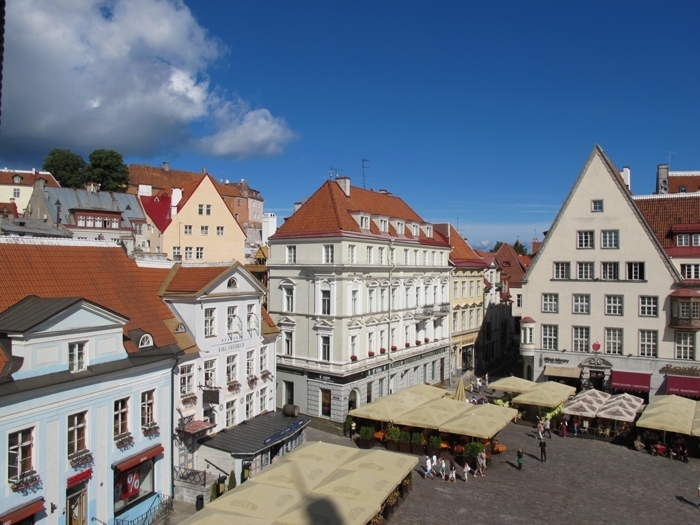 The original building was erected during the first third of the 14th century for the Brotherhood of the Blackheads Guild, a guild for unmarried German merchants in Riga. Major works were done in the years 1580 and 1886, adding most of the ornamentations. The structure was bombed to a ruin by the Germans in World War II and the remains demolished by the Soviets in 1948. The current reconstruction was erected from 1995 to 1999. St. Peter's Church at night. 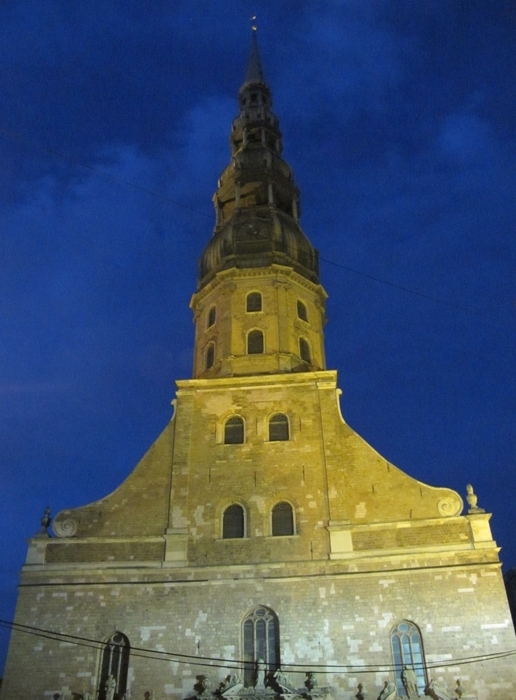 This is one of Riga's most well known landmarks and was just around the corner from our hotel, The Old Riga Palace. 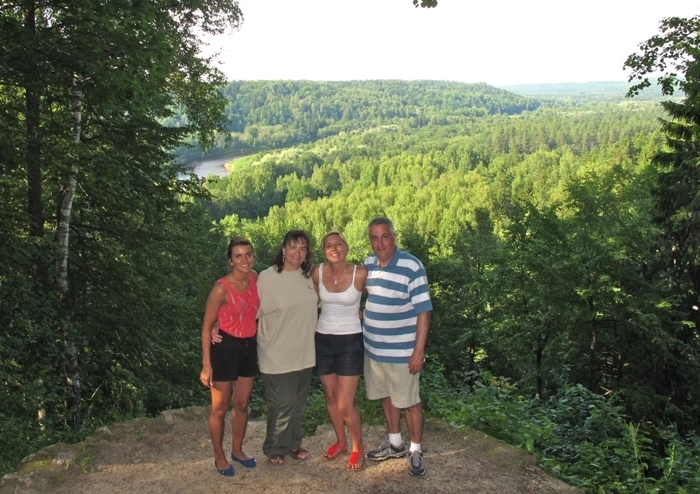 Today we headed to Sigulda, which has a beautiful national park, in Eastern Latvia. 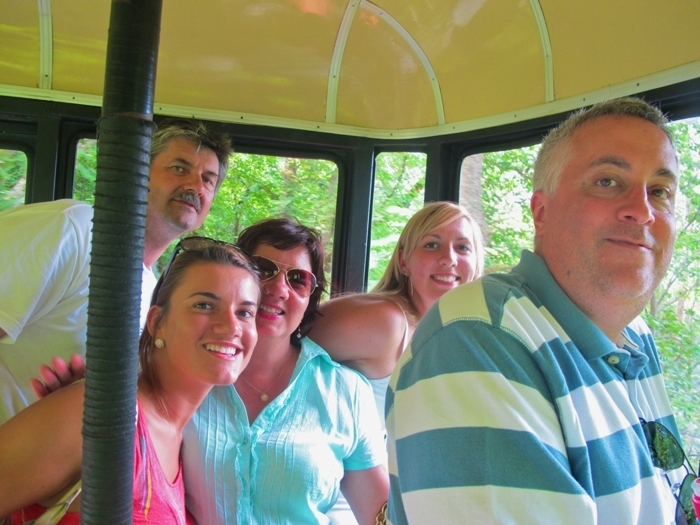 We took an air tram across a gorge from Sigulda to Krimulda and back again. This photo was taken on the tram. 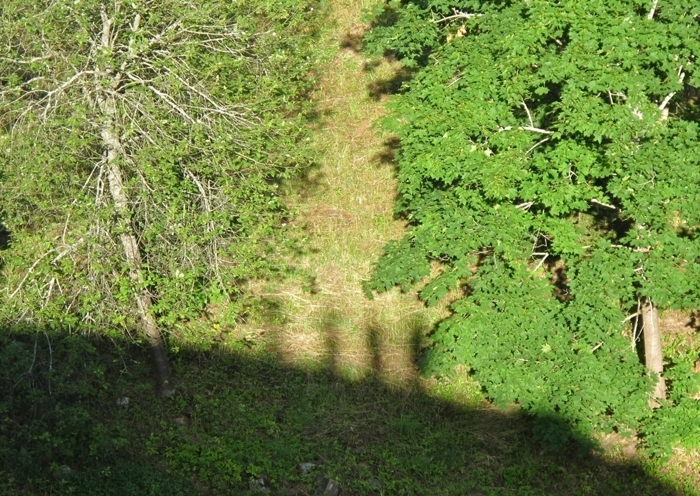 Imants, Madara, Ingrida, Lasma and Ken are taking a break from searching for bears at the top of the trees below us. 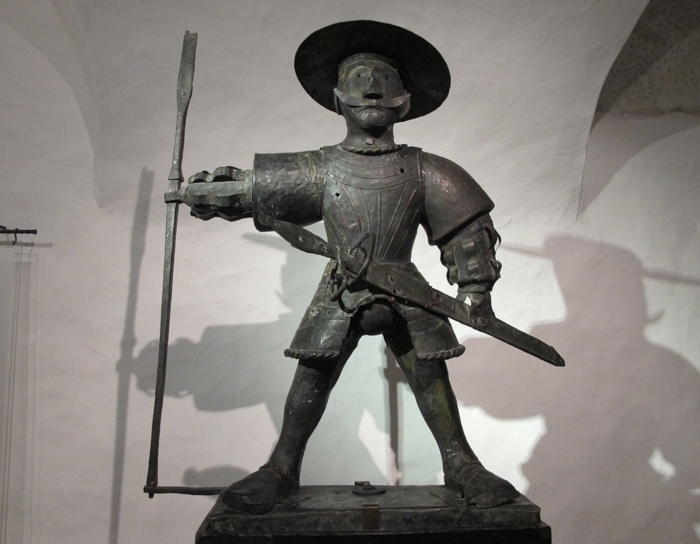 From Wikipedia: "After a battle at the foot of Turaida Castle in 1601, the castle clerk, while searching for survivors, found a baby in the arms of its dead mother. He called the child Maija and brought her up as his own. She grew up to be very beautiful and so was known as the "Rose of Turaida". She fell in love with Viktor, the gardener at the castle of Sigulda (opposite Turaida over the Gauja River) and in the autumn of 1620 they prepared to be married. Shortly before the wedding Maija received a letter from Viktor asking her to meet him at the Gutmanis Cave, their usual meeting place. She went to the cave with Lenta, the young daughter of her adoptive father. When she reached it, however, it was not Viktor she encountered but a Polish nobleman or soldier called Adam Jakubowski who was lying in wait for her with the intention of forcing her to be his wife. Maija promised to give him her magic scarf, that had the power to make the wearer immune from injury (in some versions the scarf is impossible to cut through), if he would let her go, and persuaded him to test its power on her. He struck her with an axe and she died, having thus saved her honor. In the evening Viktor came to the cave and found the body of his betrothed and was accused of the murder. But in court there appeared a witness called Peteris Skudritis, who testified that he had been commissioned by Jakubowski to deliver the fatal letter. The girl Lenta confirmed the course of events. 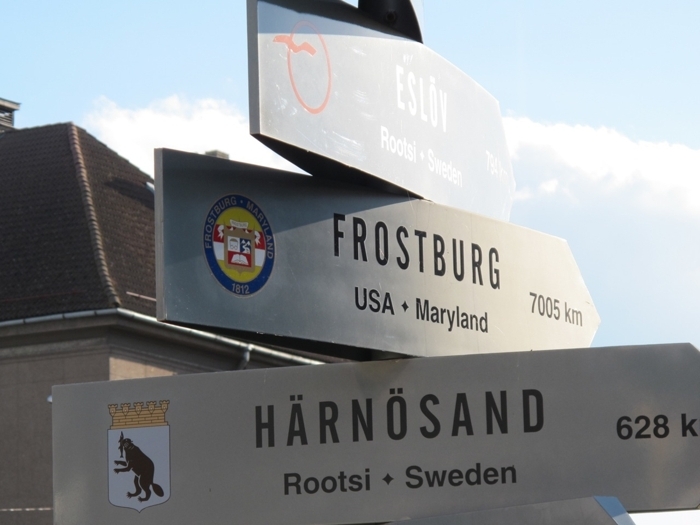 Viktor buried his betrothed near the castle, planted a linden tree on the grave and left the country for ever. 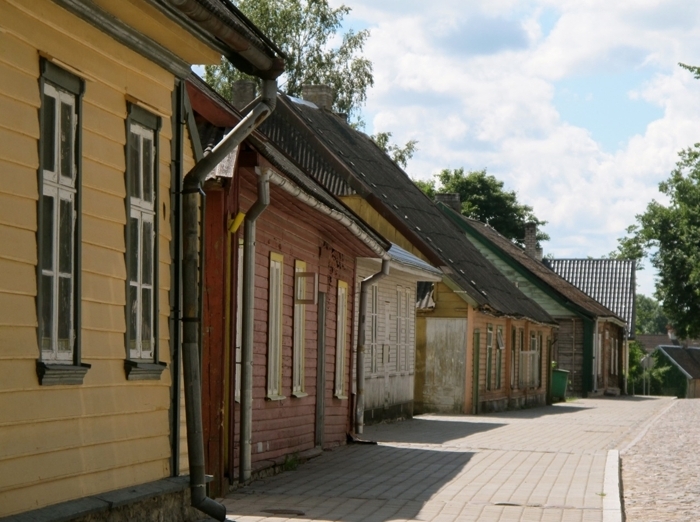 According to documents in Sigulda's archives the soldier was later caught, tried and hanged for his crime. From then on it has been customary for newlyweds to leave flowers on the grave of the Rose of Turaida in hopes of knowing the same eternal love and devotion." 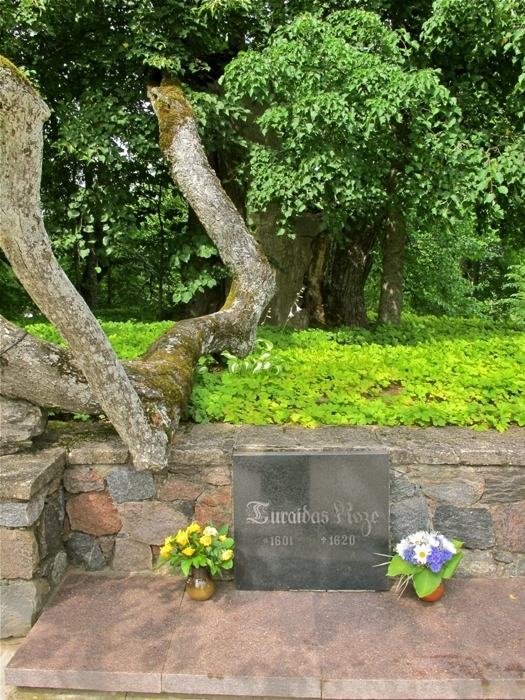 This is the grave of Maija at Turaida Castle. She died in 1620. 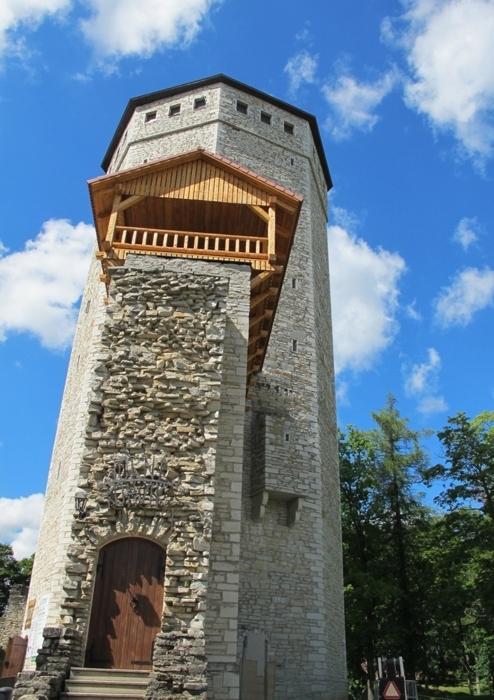 Turaida Castle is a recently reconstructed medieval castle on the opposite bank of the Gauja River from Sigulda. 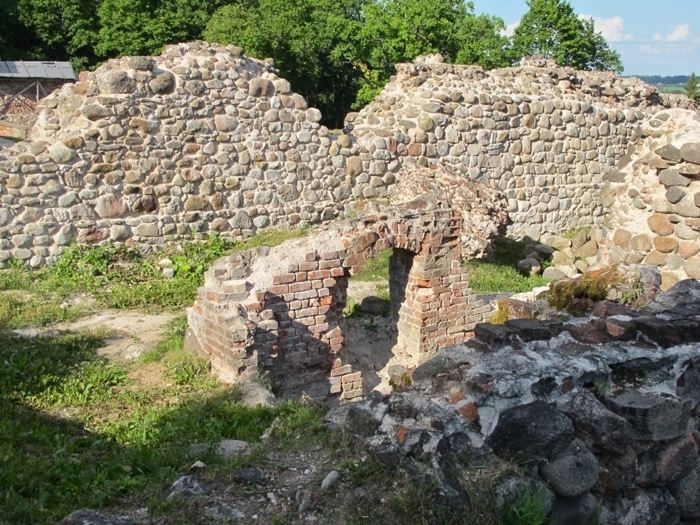 The castle was constructed in the Brick Gothic style in 1214 under Albert, archibishop of Riga, on the site of the destroyed wooden castle of the Livonian leader Caupo of Turaida. Construction and development of the fortifications continued to the 17th century, when the castle started to lose its strategic importance. It was badly damaged by fire in 1776 and not reconstructed, and in the course of time fell into ruin. 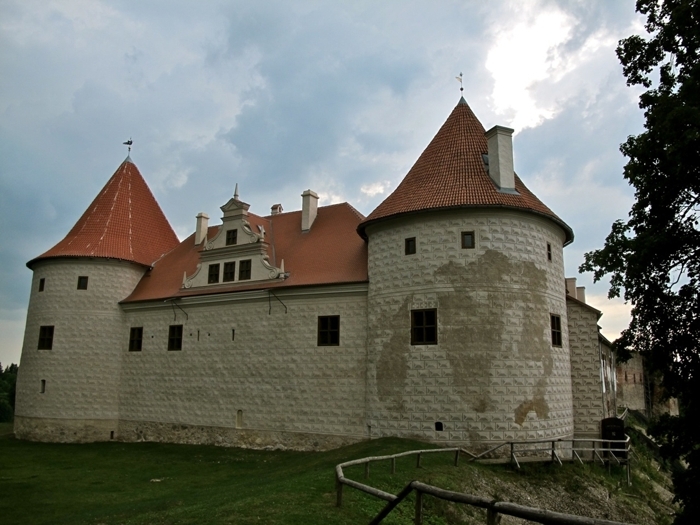 Restoration began in the 1970s and the castle is now the centerpiece of the Turaida Museum Reserve. Here we are standing at the entrance to the old castle. Ken took this photo from the top of the keep, looking down into the courtyard of Turaida Castle. He climbed it with Lasma and Madara, while Judy did some shopping in the gift shop at the bottom of the keep. We took a walk to an overlook favored by painters seeking to be inspired by the gorgeous view. Ingrida told us that this overlook is full of painters with easels in the fall, when the autumn colors are at their peak. We left Riga today and headed up the coast in our rental car towards Estonia. 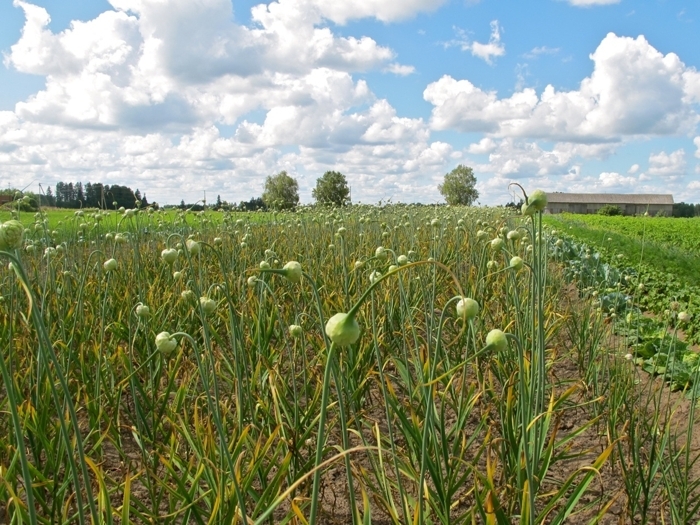 On the way, we passed through several seaside towns including Saulkrasti and Rakari, where this photo was taken. The Baltic Sea's salinity is much lower than that of ocean water as a result of abundant freshwater runoff from the surrounding land and from approximately two-hundred rivers, combined with the shallowness of the sea itself. We arrived in Pärnu this afternoon, a city in southwestern Estonia on the coast of Pärnu Bay, an inlet of the Gulf of Riga in the Baltic Sea. It is a popular summer vacation resort with many hotels, restaurants, and large beaches. The city was full of people, an interesting choice when we were mostly interested in an evening of rest and relaxation! 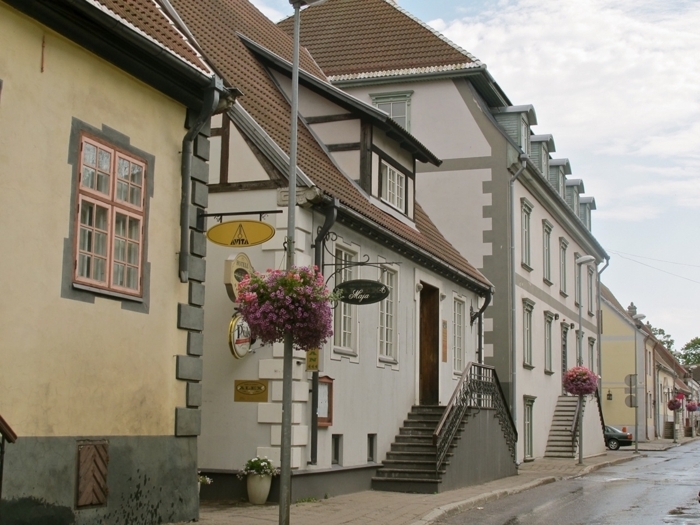 It is a quaint town, with lots of colorful buildings and people. This is one of many local churches in the town. 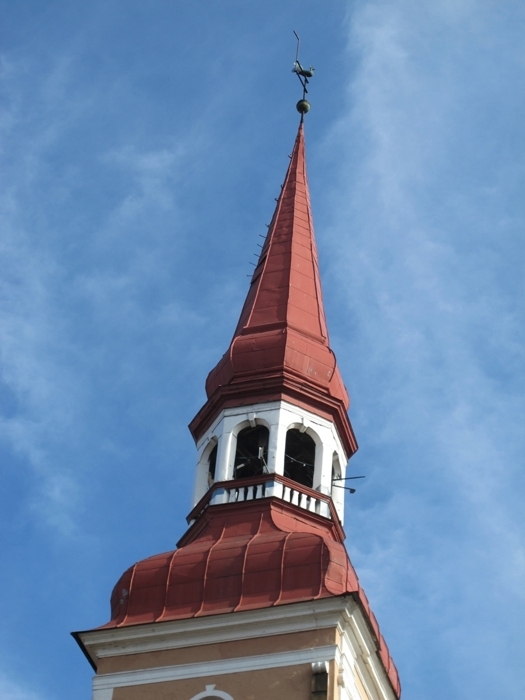 We were curious about the tradition of putting a rooster on top of an orb on Christian church steeples rather than a Christian cross. This was common in Riga, and we saw it on many Estonian churches, too. We're still looking for the symbolism of this practice. 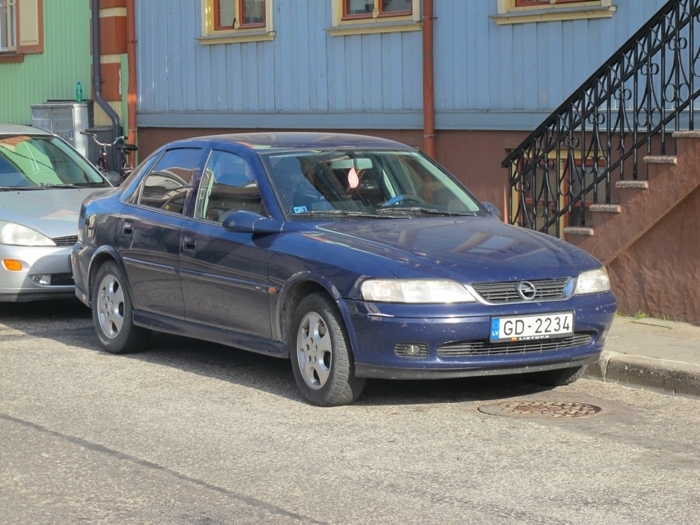 The car we rented in Riga, Latvia, is an Opel Vectra, a car engineered and produced by Opel, the German subsidiary of General Motors (GM). 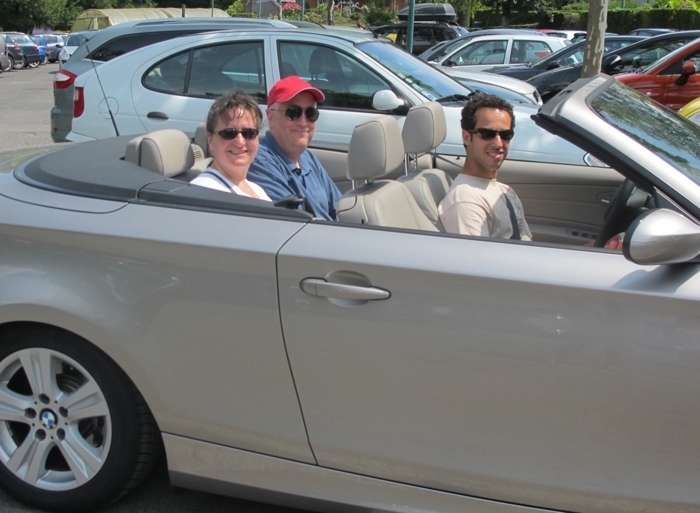 Imants and Lasma thoroughly researched our rental car options. They did a great job for us, as they saved us a bunch of money and the car has served us well so far on the trip. Thank you, Imants and Lasma!! 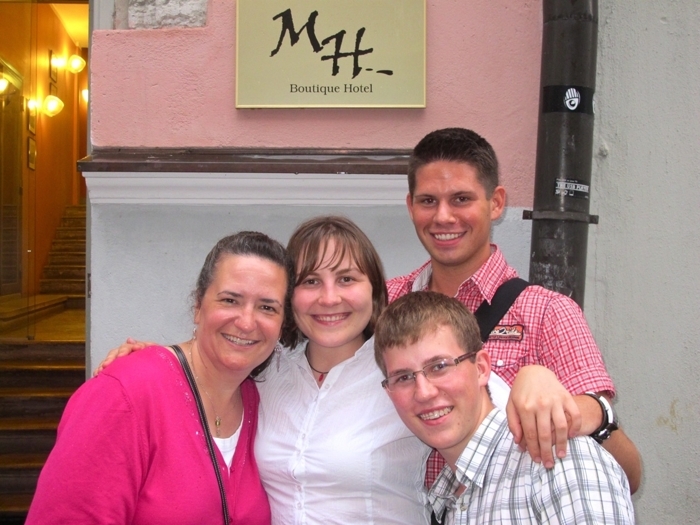 We stayed the night at Alex Maja, a hotel in a renovated centuries-old merchants house. Our room overlooked a courtyard that the hotel used for outdoor seating for its restaurant patrons. 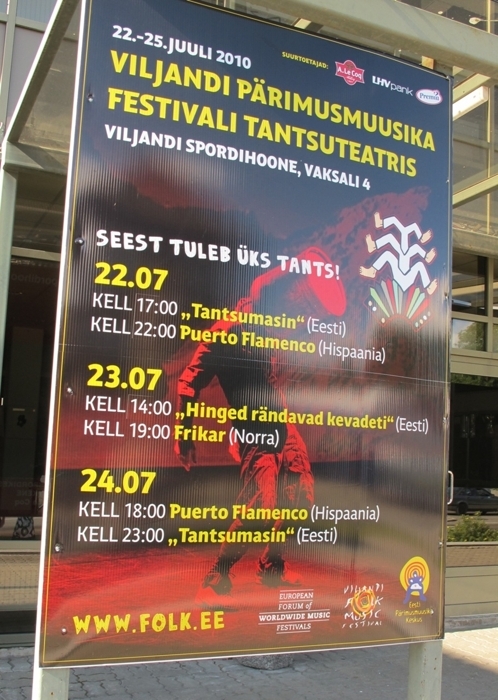 With no air conditioning and needing to leave the windows open, we spent the evening listening to the activity from the restaurant, which included Estonian karaoke for several hours. Some was good...most, not so good. Luckily the restaurant closed at 12:00 AM! 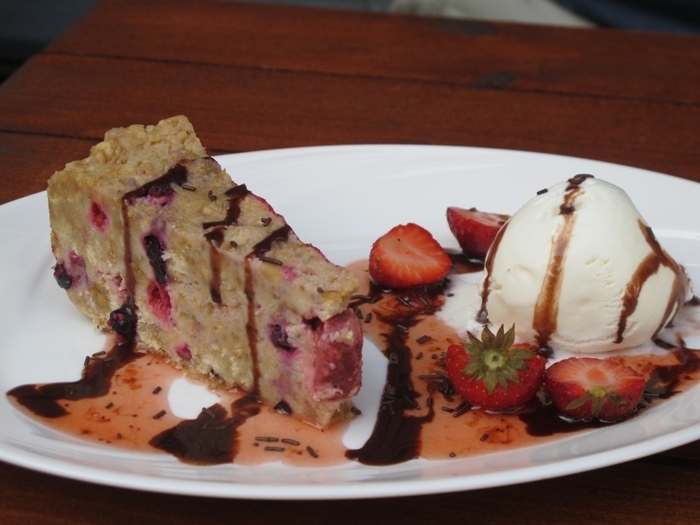 Our Estonian dessert, a cake that reminded us of something Krista would make. It was very good, but Krista's cakes are better.